If you select an item in a listbox it gets the default selection color (usually blue) as background. Even if you specify a custom data template. The reason is that the blue background (or gray if the control is not focussed) is drawn outside of the data template. So you have no chance to override it from within the data template. The color used to draw the blue and gray background are system colors. So the easiest way to get rid of these backgrounds is to locally override the highlight and control brushes of the system colors. 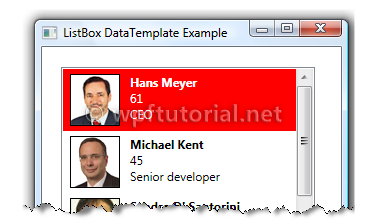 The following XAML snippet shows how to apply the style to the listbox. Thanks a lot! I spent 1+ days trying to solve this, thought it was hidden style overriding my setting, never thought of system colors! 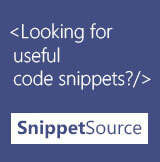 No, it only replaces the system color key for the control that uses the style template "myListboxStyle"
I'm looking for an other solution on windows phone 7 with Silverlight because <Style.Resources> doesn't exist. Thanks for the solution. It works great in this form, but I would like to use a custom color (instead the wpf's built-in colors). Is there any way to solve my problem? Thanks for help! Hey Thanks alot.. your site is damn good. it is very helpful. I'm trying top apply the same thing on a ListView but it doesn't work. I've heard it could be due to the fact that this isn't supported on Windows 7. Any truth to this ? Is there another way to accomplish this ? I was tryin to diasble selection of node in treeview.. tis helped me to achieve it by givin d highlight colour brush same as d background colour of my window.. thanks alot..